In this era of digital saturation it is not often that a mere Facebook Group stops you in your tracks, grabs your attention, and won't let you go. Less than a week ago Disney producer Don Hahn started a Facebook Group titled We Worked At Disney Animation In the 80's and 90's. I won't post the URL here because the group is a closed group: open only to, well, people who worked at Disney Animation in the 80's and 90's. Already it has well over a thousand members and a ridiculous number of posts. Like many of its members, I can't stop reading it. Looking at the posts, which include memorabilia, old photos, shared memories, stories and anecdotes, it's like the best reunion party you've ever been to. It's what makes Facebook such a compelling solution to our 21st century isolation - you can hang out with your old buddies without ever leaving your living room. So, anyone from the olden (and golden) days at Disney who isn't on Facebook and hasn't found the group - come and take a walk with your ex-colleagues down memory lane. You won't be disappointed. Like everyone else who is losing hours of their life reminiscing about their lost Disney youth, I must thank Don Hahn for taking a simple, obvious (in hindsight) idea and making it come to life. thanks for sharing this amazing journey. It's really happy to see this post. Who is the man standing third from the top left, the one pulling his jacket open? 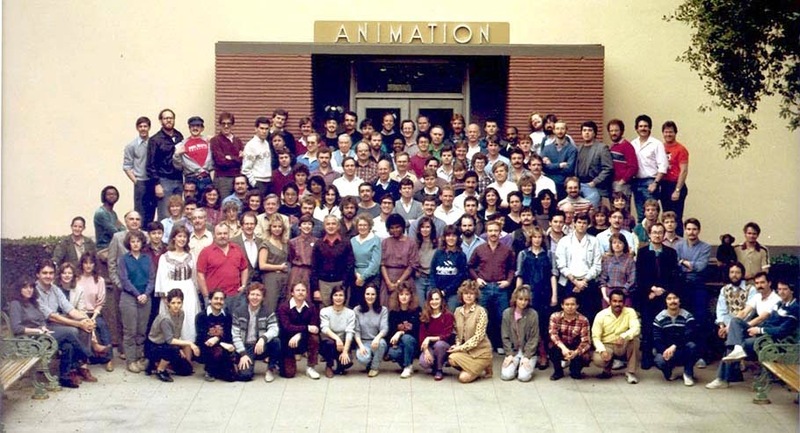 I saw a very large copy of this staff photo at an exhibit recently and the red shirt he is showing off says "Don Bluth Animation". Don himself? Seems a bit shorter than other pictures I have seen. Any idea? Brazen guy to crash the staff photo like that!